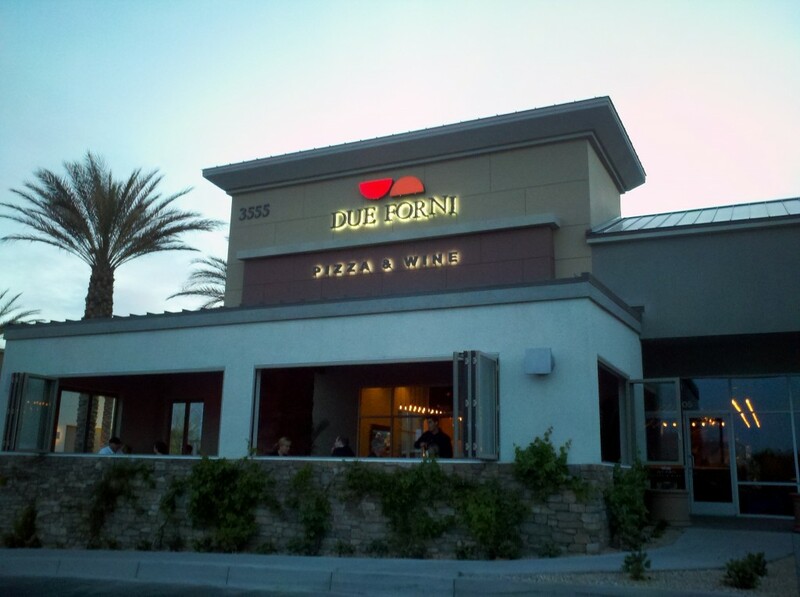 There might be no greater leap of faith in the culinary world then going from the cosseted confines of a Vegas Strip Casino dining room to an off-Strip independent restaurant. 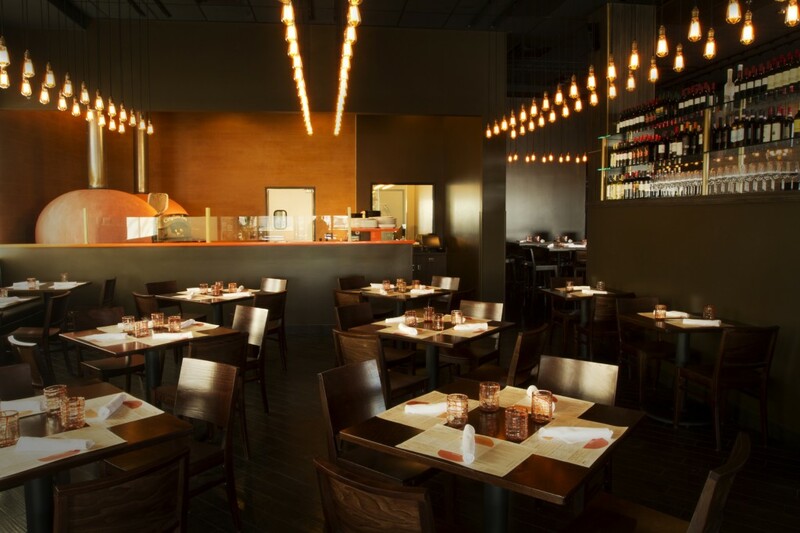 On the Strip, a chef can enjoy some of the best kitchen operations in the country, efficient supply channels (with economies of scale), expensively-designed dining spaces, mighty-muscled PR and Marketing teams, and almost certainly a steady stream of customers. Off-Strip, in a community that is bizarrely more attracted to national chains than local stars, and continually seduced by dining deals, you can get more attention being an ignominious flop than actually making good food. 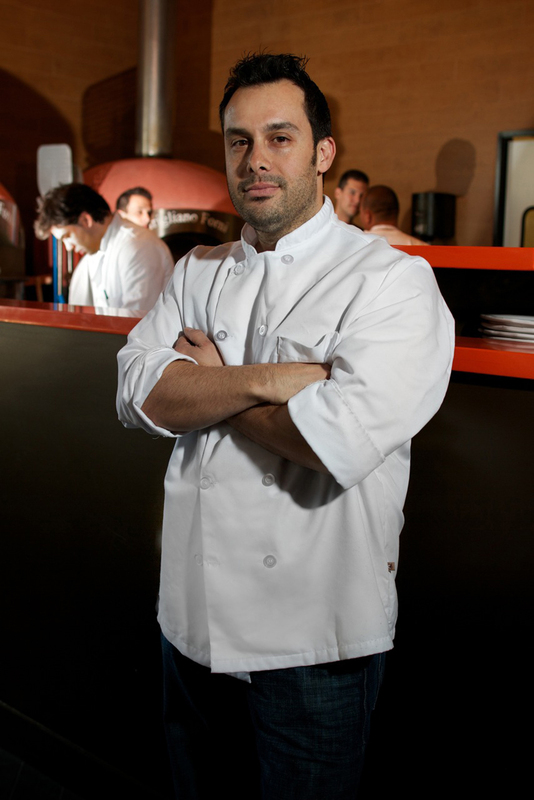 So it certainly took some guts for Carlos Buscaglia, formerly one of the best Italian chefs on the Strip at the MGM Grand’s Fiamma Trattoria, to take that leap and open up a pizza place on Summerlin’s Town Center Drive, particularly in the middle of a severe economic downturn. Thus far, Due Forni Pizza & Wine seems to be doing fine… but if it fails, don’t blame the food. The concept here is a play on duality: Due Forni has “due forni,” i.e. two ovens in Italian, specifically two Italian-designed pizza ovens which constantly rotate to cook evenly. They are electronic, not wood-burning, which is somewhat heretical to traditionalists who feel that a pizza needs to be unevenly cooked and half-charred to be “authentic.” Apparently the actual Italians who make these ovens disagree. The concept is further spun to offer the two dominant types of pizza in Italy, Napoletana—which we all know—and Romana, which is thinner and more crispy. One is cooked in each oven, the former for 90 seconds at 900 degrees, the latter 500 degrees for three minutes. Both are offered as a margherita and six other intriguing varieties (though likely Carlos will put any variation you want on your pie–he is not one of those “no substitutions” pricks) for $13 up to $21 for the fanciest, a black truffle and egg Tartufo so rich there’s no way you could finish it. For wine, they offer 38 labels, dominantly red, dominantly Italian, but with a few Californians, one or two French and New Zealand’s Cloudy Bay SB. Every single one is available by the glass–20 of them, as the menu points out, under $15 (and nine of those under $10, as are all ten beers). Of course, there’s also California cult The Puzzle and Super Tuscan Tignanello if some Summerlinian wants to splurge. Like any pizza place, they offer some starters too, though here, Buscaglia clearly goes past the expected, delivering fine-dining level salume, assagnini and salads. You’ll notice one glaring omission: pastas (as Carlos explains to me afterward, those two ovens are actually the only heating elements in the entire operation, and at least by my visit he hadn’t figured out a good way to make pastas with them. That may change, but in some respects I like the idea of an authentically Italian restaurant bucking expectations). My visit was a proper tasting, which means Carlos knew I was coming, but didn’t know what I’d be ordering, and for those who assume that only anonymous reviewing is valid, I’ll just point out two obvious facts: no one in the restaurant appeared to be getting any less attention than my family, nor did their food look any different than mine (it’s not like a chef can replace their normal ingredients with some ‘special’ better stuff, and it doesn’t guarantee everything comes out perfect). As it happens, the chef sent out a lot of samplings which allowed me to have a far greater idea of the menu than any normal person could in one visit. We started with two of the “Cold Apps” and all three“Hot Apps:” tuna crudo, beef carpaccio, scampi prawns, turkey polpette, and semolina gnocchi. 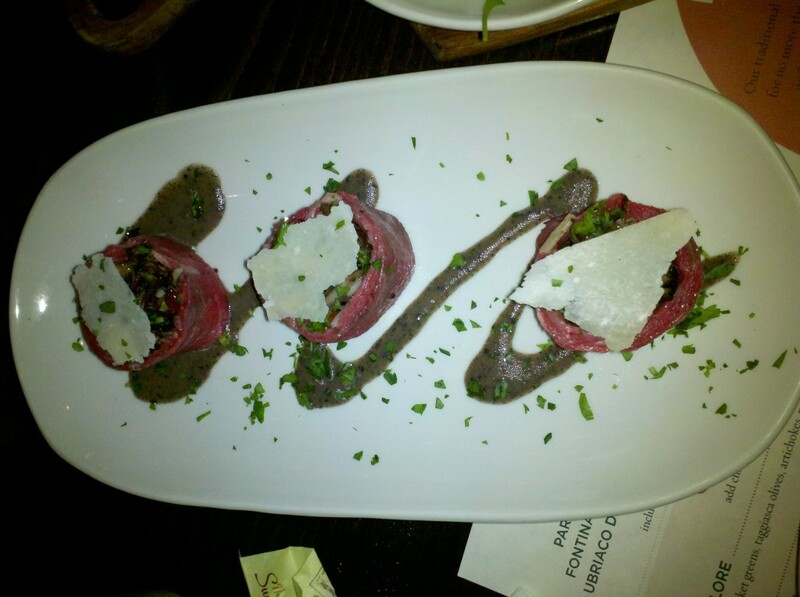 On the cold side, I loved the carpaccio: prime beef, wraped around arugula and pignoli like cut sushi, and topped with shaved parmesan and black truffle vinaigrette. 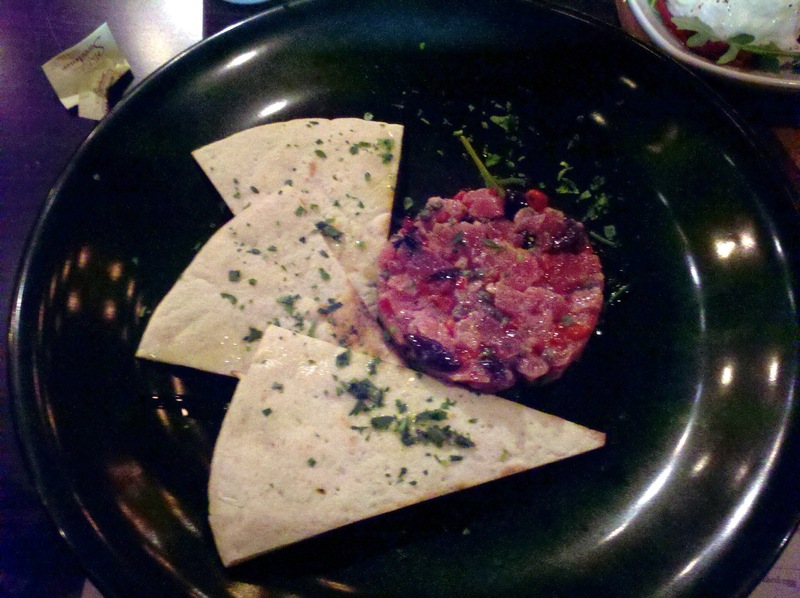 The ahi tuna crudo, mixed with Fresno pepper, capers, olives and lemon-infused truffle oil seemed to have a slightly grainy texture and was dominated by the lemon essence. Of the hot apps, I absolutely loved the semolina gnocchi, shaped like pencil points and served in a sort of carbonara with black truffle crema, smoked nueske bacon and peas, a hearty portion which could easily work as a second entrée with a pizza. The black tiger prawn scampi came with fregola, a kind of Sardinian cous cous, and had a lovely fragrance, but something about the garlic and white wine in the recipe left a bitter aftertaste. 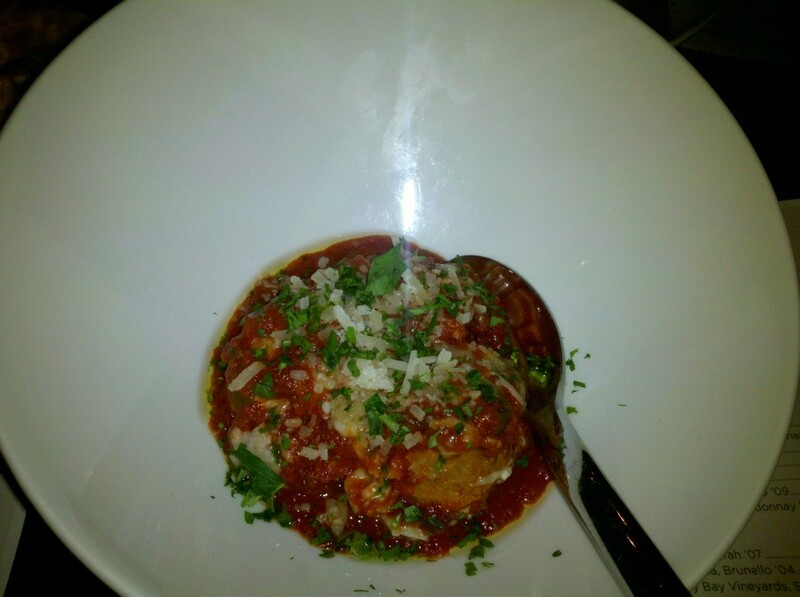 The ground turkey polpette came in a wonderfully bright, fresh san marzano tomato sauce, but the meatballs themselves were a bit bland, despite nice texture. More seasoning or just adding in pork or veal would help. Normally the mozzarella bar here is offered as one of three Campagnia mozzarella choices and a side such as roasted red peppers, Sicilian anchovies, marinated roman artichokes, prosciutto San Daniele or three others. 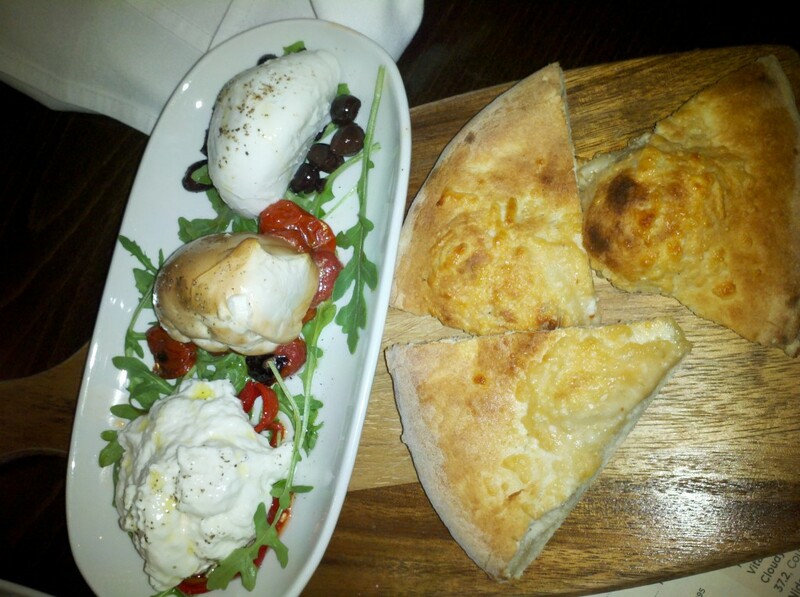 Lucky for me, I got to sample all three cheeses with some plain pizza dough on the side. The stracciatella was by far my favorite, soft creamy and light; the classica was fine but nothing special, and the smoked mozza was smoked with the wrong wood, methinks. It just tasted like it’d been left in a house that burned down. We sampled Neapolitan versions of the house signature Due Forni, an adaptation of the margherita with san marzano tomato sauce, campagnia bufala mozzarella, house made crumbled sausage, nueske bacon and pequillo peppers. 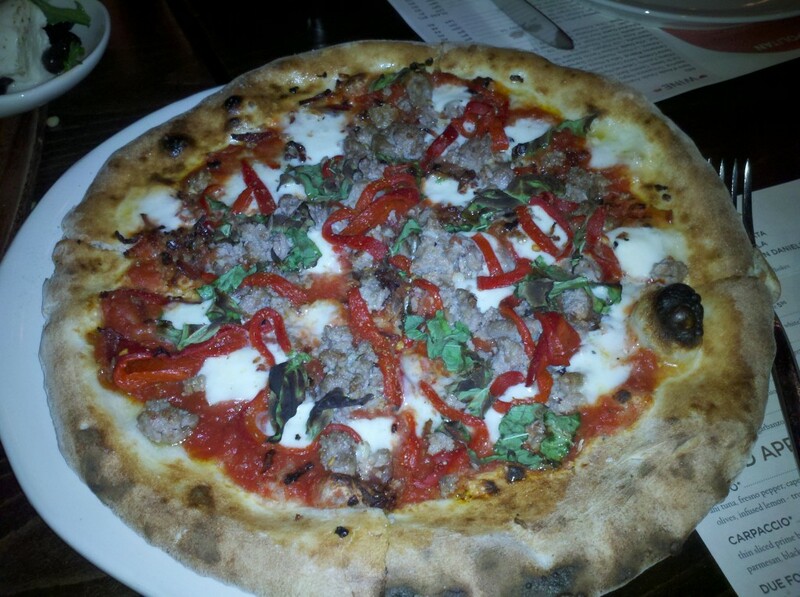 This was just a pure, perhaps slightly Americanized pie, with juicy savory sausage and peppers. While these ovens avoid the charring that wood ovens give you, as the pics show, you still get hot spots on the dough, which was that classic chewy/crisp crust that you want in a Napoli pie. 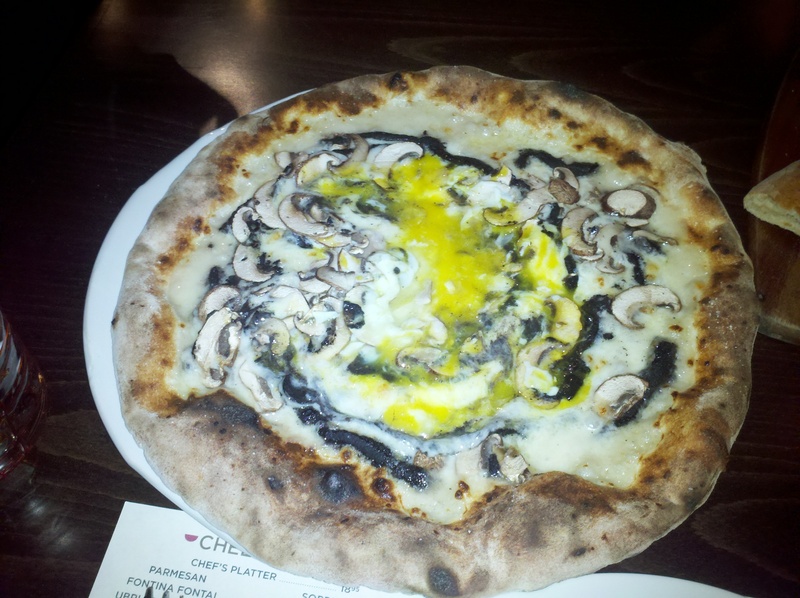 The second Neapolitan was a fancy Tartufo, layered with sliced black truffle, roasted cremini mushrooms, parmesan crema and fontina, with an egg barely cooked on top, then spread over it at the table. This thing was as rich as you could imagine, incredibly earthy , creamy, actually heady. If there’s such a thing as “orgasmic” pizza, this is it. 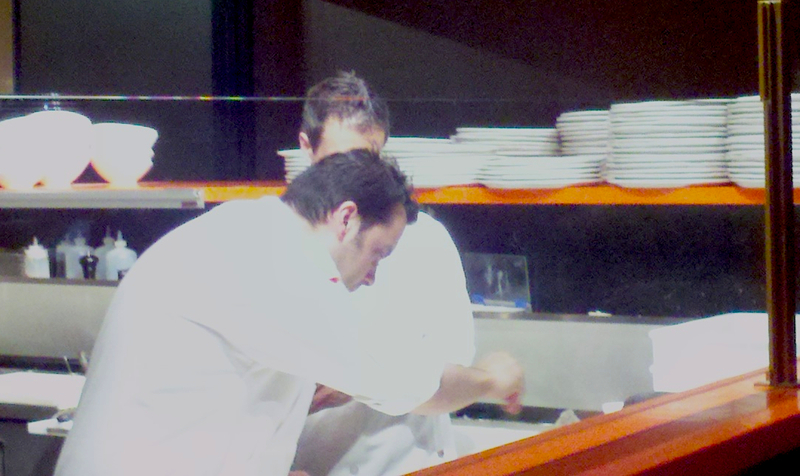 Speaking of table service, one thing Due Forni does that I like a lot: they deliver the pizza uncut, Italian style. And then at the table, they give it two quick slicings, almost like stamping its passport. Nice. The last pizza was a Bianca al proscuitto cotto, Roman style, which as the name indicates, was simply white pizza with cooked ham, fontina cheese, caramelized onions, fresh oregano and a drizzle of aged balsamic vinegar. That too was rich, the crispy Roman dough more like a delivery system for the meat and cheese than a strong flavor component itself. I had a glass of Sella & Mosca Cannanou Riserva ’09, which went particularly well with the Due Forni pizza, but didn’t clash with anything. They insisted on bringing me some dessert as well, but I’ll be darned if I could remember it. I was absolutely food-coma’ed by then.